Never made a summer pudding before, but when you’ve got a total crop of 13 redcurrants, 2 blueberries, 6 ripe blackcurrants, five ripe raspberries and a whole ton of strawberries, it’s the obvious option. Seems like a traditional summer pudding doesn’t use strawberries at all, but I cobbled together various recipes from the internet – mainly using delia’s – and the sky didn’t fall in. The key is to simmer the currants and blueberries for about five minutes and only add the softer fruit – the strawberries and raspberries – a few minutes from the end. I’m always amazed when I follow a recipe and the result is edible. 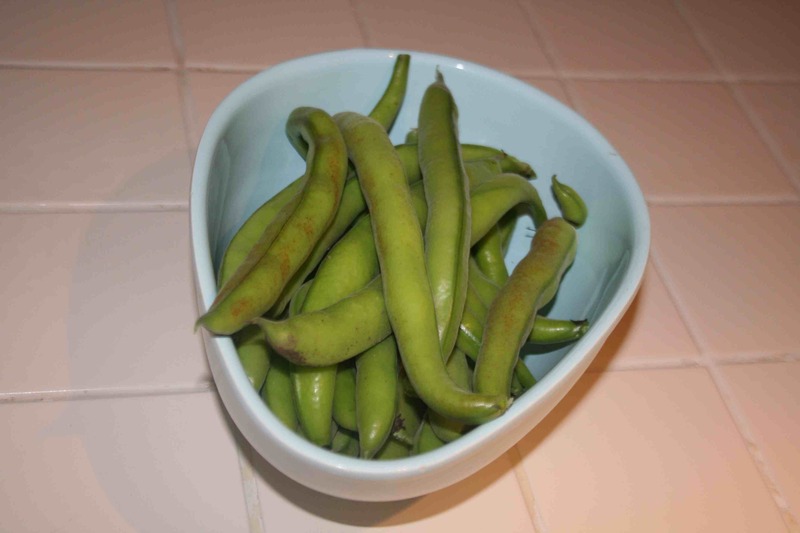 It’s also nice when growing fruit and vegetables in a garden 45×15 foot actually results in a proper dish – which turned out to be absolutely delicious of course (when are you ever going to hear a home-grown person saying otherwise?) – as opposed to barefoot dressing-gown snacking. And I picked sweetpeas today and put them in an actual vase. Oh God, I’m turning into Martha Stewart. I’m sure at one stage I used to have a life, with a desk and a social life and lunch at Pret a Manger. I blame childcare. 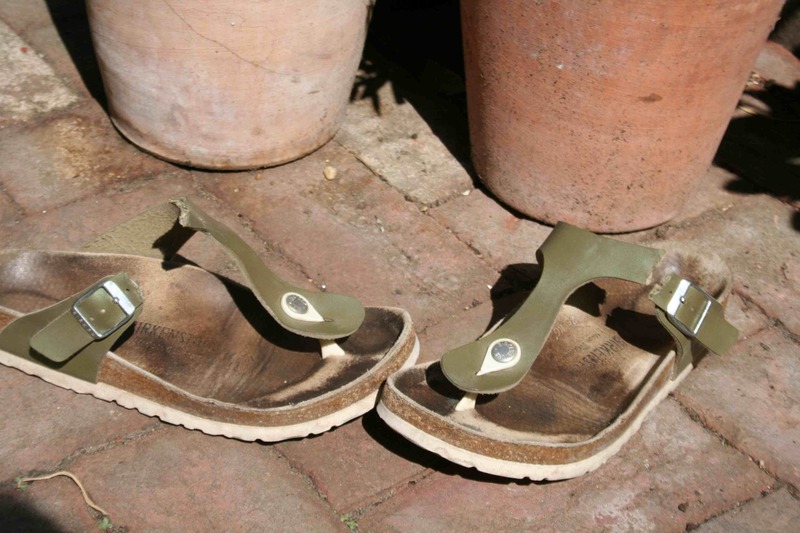 Apologies, by the way, for the less than pristine soles – what do you expect, I’m a gardener? – but I draw your attention to the almost surgical way the leather has been snipped by, I’d put money on it, Mr Fox. Isn’t it creepy? It’s not like they had a good chow down on the foot-fragrant leather or took it off to their den to hoard it or anything animalistic like that. Instead it’s an act of discreet sabotage, a fashion critique, the nip of sartorial disapproval. Last year, they did it to the blue ones. What do London foxes have against sensible German footwear? What do you mean you don’t know the whereabouts of your nearest defecating horse? Much excitement at gardening school this week since we were asked to bring in a sample of our soil. We plopped our precious offerings on the table and then had to do chemistry tests on them with white powder and tiny spatulas. It was all rather Groucho club toilets circa 1990. The fabulous news is that I seem to have great soil so well done me. Apparently it’s a light sandy loam which means it drains well, is easy to cultivate and warms up fast so you can plant vegetables in it before other people can. My poor neighbour, on the other hand, had a heavy, claggy clay-silt that just wouldn’t settle in his test tube and made the table shake when he heaved it out of his bag.We were all sympathetic. Secretly, though, I was feeling quite smug. Did I mention I had a light sandy loam? If you don’t have a soil testing kit, then there’s a lower-tech way to discover what you’re standing on. Pick up a handful. If it won’t form a ball and feels gritty, it’s sandy; if you can form it into a thick cylinder but not a thread, it’s silty; if you can form it into a ring, then it’s a clay; if you can’t form it into any shape at all, it’s a patio. the country and then buy a horse. which causes constant visits to weather forecast websites and an obsessive attachment to horticultural fleece – can be almost debilitating. If – and obviously this has never happened to me – you’ve ever considered cancelling a long weeekend in the south of France for fear of leaving a dozen Gardeners Delight tomato seedlings to the elements, then you’re the sort of floundering idiot experienced gardeners would accuse of knowing nothing whatsoever about anything at all. If so, advise them to add some well-rotted manure. Author AlexMitchellPosted on June 24, 2008 Categories Journalism, books, TVLeave a comment on What do you mean you don’t know the whereabouts of your nearest defecating horse? Concerned reader(s) will be relieved to know that my potato pique has subsided in the face of saturated fats. 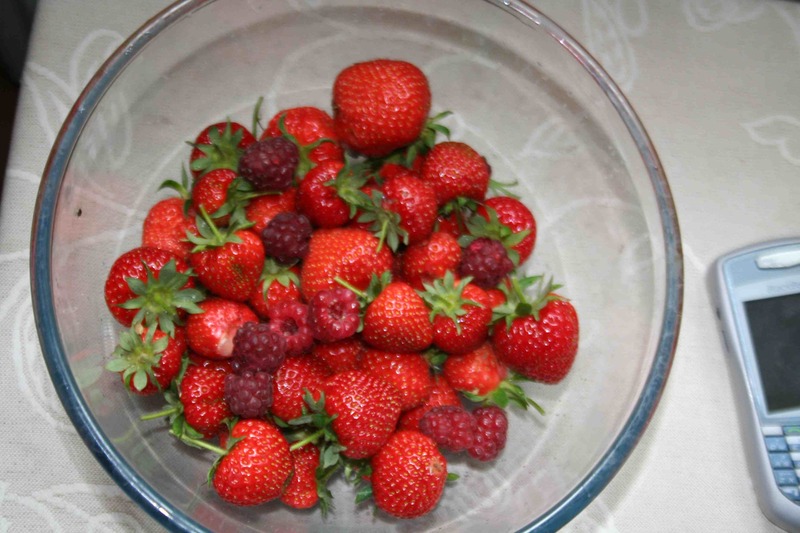 In other words, I’ve just eaten a bowl of strawberries and raspberries with double cream, straight from the garden, natch. Yesterday it was rhubarb with redcurrants (I don’t need to mention the cream again, it’s obviously compulsory.) Sometimes it all seems so very worth it. Only one thing. 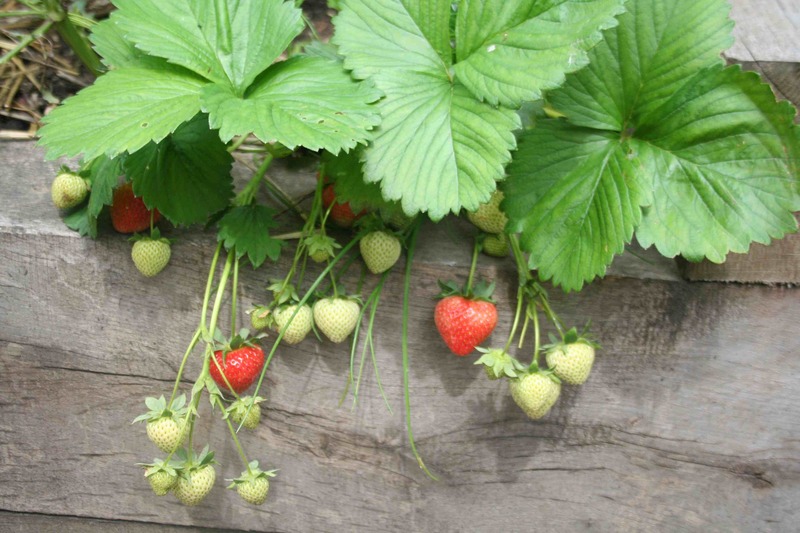 You know when you see a strawberry and think, that looks lovely but maybe I’ll give it one more day and it will be absolutely ripe and the most perfect thing ever? How do the little black slugs, who have totally ignored them until now, know that that is the very night to drill holes in them? Uncanny. Right, that’s it, I’m officially hacked off. 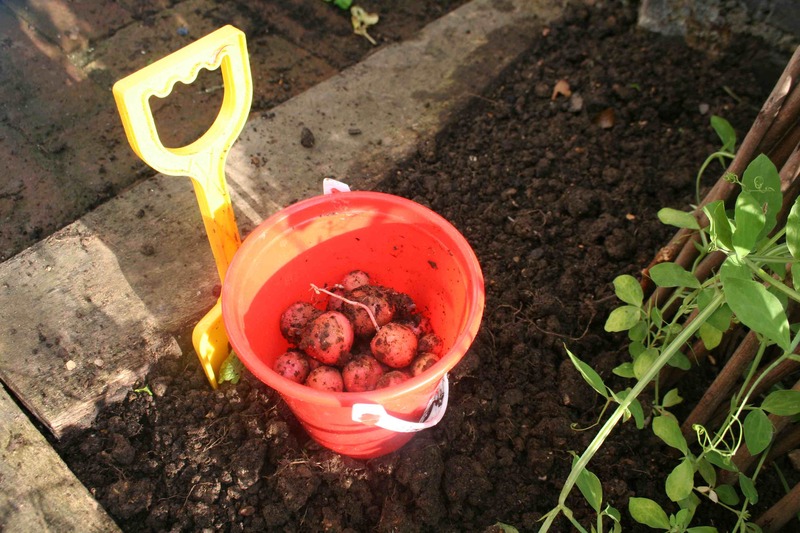 They were watered, earthed up, cossetted… for God’s sake, I only stopped short of putting an After Eight on their pillow every night, and my Mimi potatoes are still a disaster. 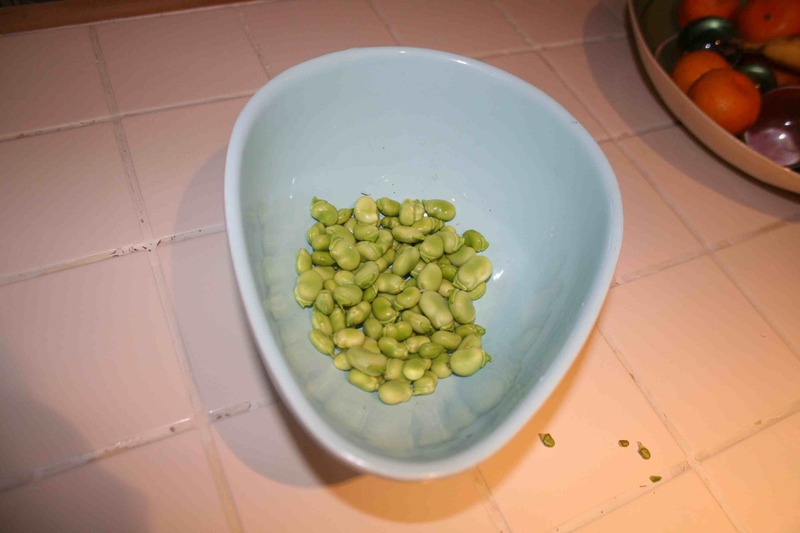 (Those, by the way, who are looking at the picture and thinking, what’s she complaining about, they fill half a bucket? should know that this is a toddler’s bucket, as illustrated by the helpful accompanying spade). OK, so I didn’t feed them. And maybe they were in quite a shady spot. But the soil was manured last year and had compost added this and the whole point of Mimi potatoes is that they’re first earlies so supposed to be ready 10 weeks after planting and, come on, four whole plants growing away there for 94 whole days of my life – that’s even more time than you can be held in a British prison without charge – and I’m left with this? Please someone, tell me where I went wrong… I’m off to the beach to make a sand castle. Saved by the man with the pony tail? Sometimes, when Eric Robson’s ‘jokes’ aren’t rendering me temporarily deaf in self-preservation, elements of Radio 4’s Gardener’s Question Time creep into my subconscious where they linger and fail to drop into the slop tray of forgettances. 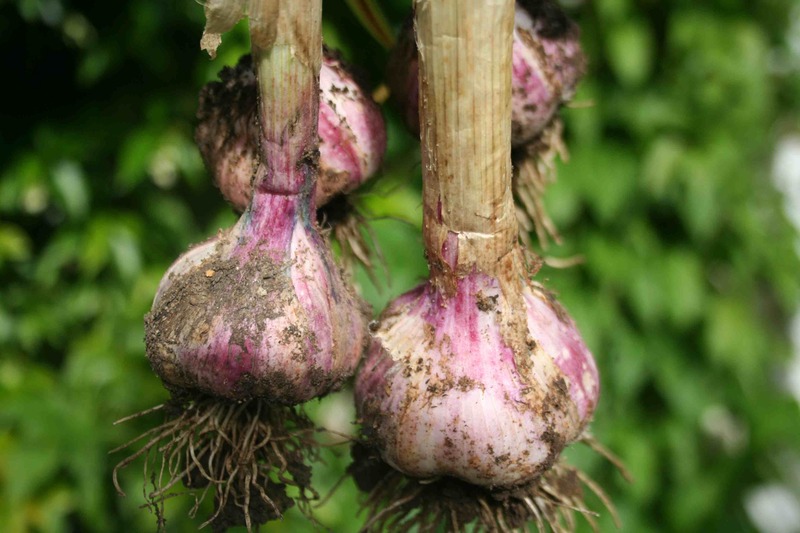 One such tip, given I think by Pippa Greenwood, but possibly he of the extremely creepy ponytail Bob Flowerdew, was about how to get two crops out of autumn-fruiting raspberries. My ears pricked up at this since, with a little city garden, I can only fit in one raspberry bush, Autumn Bliss. 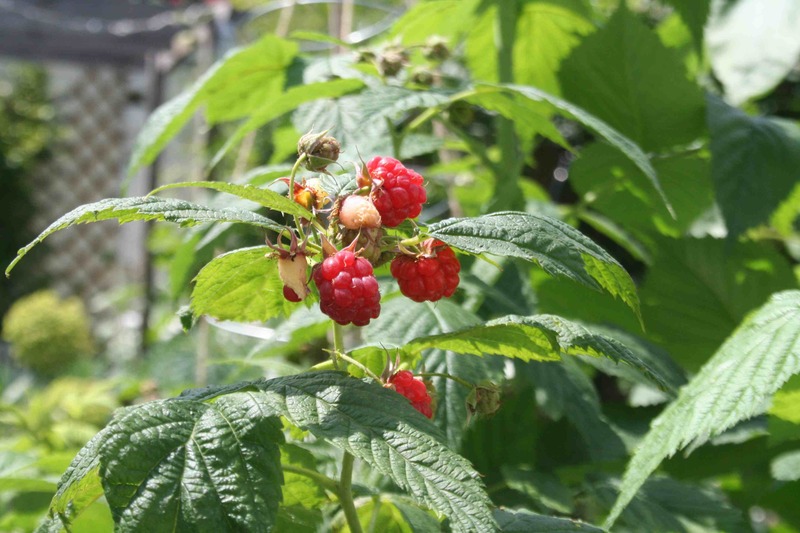 The traditional advice for pruning autumn-fruiting raspberries is to cut the canes to an inch of the soil in February, so new canes can grow up and fruit by September, giving you one crop. But, aha, if you cut only half your canes back in February, you’ll not only get early raspberries around now, but your September crop too! I can now report the momentous news that it works. It may be sad to get excited about this, but it’s 9.46am, I’m pregnant and therefore go fuzzy and weird without food, there’s no bread in, and the milkman hasn’t come yet (yes, I live in London but apparently London via Trumptonshire) so no cereal. Popping out this morning and eating four (count ’em) raspberries may therefore have stopped me coming over all peculiar. Try out this newfangled pruning tip and you may be similarly saved. You read it here first (via Gardener’s Question Time – or was it Gardener’s World… or Cash in the Attic – please someone give me some food). Author AlexMitchellPosted on June 6, 2008 Categories Growing stuffLeave a comment on Saved by the man with the pony tail? I’ve been watching the drama series Heroes a lot lately – mainly because Mad Men (the best series since Six Feet Under) has now finished. Like Lost, Heroes is basically pants and utterly childish, though everything is delivered with such solemnity that they think they can get away with it. Which they obviously can since this is already series 2 and I, like many other poor souls, have wasted at least 12 hours of my life so far watching it. Anyway, Heroes, for the uninitiated, is about a group of people with superhuman powers ranging from making everyone around them die of a fatal disease to gifts of the more traditional flying and mind-reading variety. Don’t want to blow my own trumpet, but I’m beginning to think I might be similarly gifted. It’s an unusual power, granted, but not without its potential.